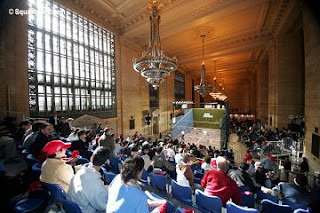 One of squash's show-piece venues, Grand Central Station in New York, is this week hosting the Tournament of Champions 2007. The terminus has hosted the event for a number of years, and provides a spectacular arena for players, spectators and passing commuters alike. Results indicate that this year's event has been one of the most exciting in its history, with seeds crashing out in a number of upsets. By all accounts the much-anticipated quarter final meeting of wonderkid Ramy Ashour and former World Junior Champion James Willstrop didn't disappoint, and those who were lucky enough to have witnessed the first major tournament clash between two of the sport's brightest talents are already talking of it as a minor classic.